Under what circumstances do religiously motivated actors tend to advance human welfare, and under what circumstances do they tend to threaten it? Are members of some religious groups more likely to engage in welfare-enhancing behavior than in others? Do certain state policies tend to promote security-enhancing behavior among religious groups while other policies tend to promote security-threatening ones? In cases where religious actors are harming the welfare of a population, what responses could eliminate that threat without replacing it with another?Religion and Human Security shows that many states tend to underestimate the power of religious organizations as purveyors of human security. Governments overlook both the importance of human security to their populations and the religious groups who could act as allies in securing the welfare of their people. This volume offers a rich variety of theoretical perspectives on the nuanced relationship between religion and human security. 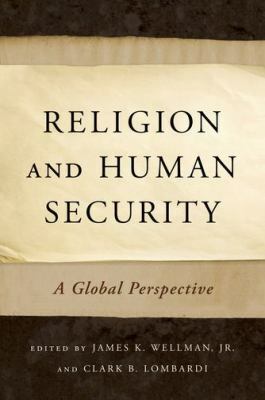 Through case studies ranging from Turkey, Egypt, and Pakistan, to the United States, Northern Ireland, and Zimbabwe, it provides important suggestions to policy makers of how to begin factoring the influence of religion into their evaluation of a population's human security and into programs designed to improve human security around the globe. published by Oxford University Press. The book received Honorable Mention for the 2009 Distinguished Book Award by the Society for the Scientific Study of Religion (second out of twenty-six books nominated). He is also the project director of a $300,000 grant from the Luce Foundation which will soon culminate in an edited volume called Religion and Human Security: A Global Perspective which will be published soon by Oxford University Press. A new book project with Oxford University Press is called High on God: How the Megachurch Conquered America. It is a based on a national survey of twelve national megachurches, examining the power of desire in these congregations, both toward each other, toward the churches' leadership, and towards God. Wellman knows American Protestantism well, and he is very interested in the future of American churches and, in particular, the trajectory of the evangelical church. Having done extensive work on Protestant leaders, church movements, and successful churches, he is perfectly situated to write a cultural biography of Rob Bell, believing, as he does, that Bell embodies and will lead the evangelical church in America in the next twenty years.